Low-code software solutions are fast to deploy, adaptable and scalable. All organizations in the modern economy have one thing in common. They run on software. It wouldn’t be an exaggeration to say that the right software is often the difference between maintaining a competitive edge and nosediving into failure. So, providing the right IT infrastructure matters more than ever. The problem for many companies is their business applications are built on legacy systems that require extensive custom coding for changes. As a result, changes take a long time and frequently introduce bugs. Further, installing modern technologies in conjunction with legacy systems often breaks the custom code, making the integration less than optimal, increasing costs, and requiring specialized skillset to manage. It’s this business imperative that’s driving the low code revolution. Forrester expects the low-code market to grow by 68 percent and forecasts that by 2019 the overall market size will reach $10.3 billion. Even at its early stage of adoption, 56% of IT professionals report they intend to increase use of low-code and no-code tools. So, how do businesses caught up in custom code-heavy systems update their IT infrastructure in a timely manner without breaking the bank? Let’s take a look at some ways the flexibility of low-code and even more so, no-code software drives IT modernization. The first instinct of companies experiencing rapid growth is to minimize disruption by scaling their existing systems. The problem is those systems don’t easily scale and deploying new software on top of custom code-based systems can take months, even a year of an IT department’s most valuable resource, time. The complexity of code-heavy software creates a barrier that often holds many IT teams back from deploying application features that enhance productivity. However, the removal of this roadblock opens the door for IT teams to update software on a consistent basis, so applications mesh with the business user’s preferred experience, yielding greater output. In turn, the malleability of low and no code platforms creates a more efficient organization by removing the need to constantly train employees on new application functions and features, as they are updated or built upon current and recognizable frameworks. For example, when ENKI, a provider of managed cloud computing services founded by Netsuite’s former Director of Engineering and CIO, found that its Netsuite Customer Relationship Management (CRM) was sluggish responding to inputs and slowing customer response times. They spent six man-months and 50,000 lines of code building a system on the NetSuite platform to address issue and time tracking, but it was still not finished. They decided to try a no-code platform as somewhat of a last resort. To their surprise, they were able to reproduce all those customizations, and more, in the space of ten days. They went live two weeks later. The result was a completely configurable system with the ability to integrate its other business applications without writing a line of code. ENKI has since used the platform to implement multiple other business requirements, such as system for tracking regulatory compliance. Difficult as it may be to give up legacy systems, the lesson is that it doesn’t pay to modify code-heavy applications by rewriting code. No code software can be deployed in record breaking time, while retaining the ability to adapt quickly to changing business needs and scale with the company. As low code platforms gain in popularity, they will offer a strategic advantage to those organizations who make the leap. As the pace of business accelerates, companies whose operations run on highly configurable low code and no code systems will gain the agility to adapt to changing circumstances much more quickly and efficiently than those on legacy custom code-based software. In the long run, relying on hand-coding and re-writing of code to is a high-risk strategy and not sustainable. Low and no code software enables change implementation in real-time, similar to drag and drop implementation. With tasks constantly piling up on IT department’s plate, being able to carry out a change within a few hours, and be confident of not breaking something, is the way of the future for IT professionals. Alongside the capability to build a working business application in as little as an hour, low code platforms also remove the risks associated with innovation. No two companies are the same, so in a perfect world, businesses would be able to rapidly build and update applications unique to their company values. This is where low can make a big difference. Without the requirement for extensive coding that exists within traditional platforms, IT teams can quickly deploy updates and new applications in tune with the company’s needs, without a line of code. For instance, when an organization launches a new internal application, the absence of code means adjustments can be made from user feedback in real-time. Essentially, low and no code solutions empower IT teams during the app creation and deployment process, affording the ability to configure applications to user’s preferences, while eliminating the need for the highly specialized coding skillset. Lastly, like the move to self-driving cars, the transition to low code software will not happen overnight. IT departments are juggling multiple software applications from various sources and vintages. It is critical that the ever-expanding and interlocking systems are compatible and work together. 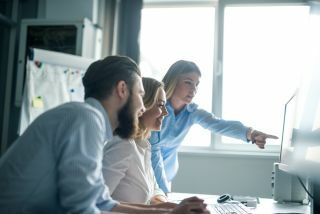 When deploying low-code solutions, IT teams should look to solutions that provide a rich and consistent user experience where all business applications work well together and are configurable to each unique organization’s internal structure. The virtues of low and no code platforms are becoming more widely recognized, as custom bugs are eliminated in conjunction with the removal of complex custom code. Adoption of low and no code platforms is still in its infancy, but as companies seek greater agility and reliability, as well as lowered deployment times and costs associated to their software infrastructure, expansion is inevitable. All in all, legacy enterprise software’s reliance on manual coding is holding organizations back. As IT departments modernize their infrastructure to meet fast-evolving business needs, low-code and no-code software solutions will rapidly gain in popularity. These solutions’ ease of deployment, configurability, and aptitude to integrate with residing business applications will deliver massive increases in productivity and business growth.